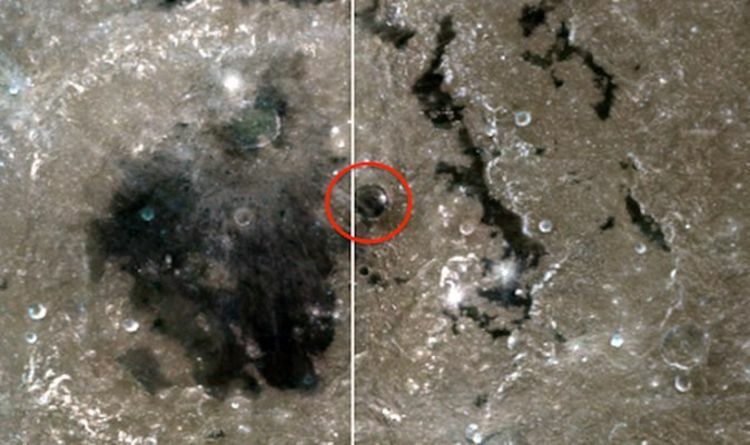 An alien hunter believes he found dome-like structures on the moon’s surface when looking through old satellite images from the mid Nineties. The structures, which were spotted on NASA’s Clementine Map, were supposedly made by a species of aliens called ‘Greys’, which are supposedly a race of super-intelligent extraterrestrials which like the dark. This is the reason they built the dome-like structures, so they can live underground in the dark. Prominent alien hunter Scott C Waring made the claims, saying he spotted several of the structures on the moon when browsing through the NASA maps. However, Mr Waring goes on to explain the structures are not visible in today’s maps, as photo-editing software was not widely available more than 20 years ago. He wrote on his blog UFO Sightings Daily: “I found many alien structures on the moon today in a NASA Clementine map. This map was made back in 1994 and it was a time before editing software was available. “From a distance, it looks like just a another crater, but close up, its absolutely a dark shiny semi transparent material made to let only a fraction of the light inside. “There is an alien species who like the darkness so much they genetically changed themselves to have sunglasses second eyelids cover their eyes at will. The greys. “They clearly created this dome city. Of course other newer photos will not show this, because they it was edited out already. But here its obvious what we see. However, sceptics and NASA would say the object and other similar findings are just the effects of pareidolia – a psychological phenomenon when the brain tricks the eyes into seeing familiar objects or shapes in patterns or textures such as a rock surface. This would mean that the moon’s ‘domes’ are likely just rocks reflecting the light from the sun, which appears as glass to our eyes.